CardioSecur ECG has the ability to go beyond standard 12-lead ECG technology in detecting and localising cardiac events like posterior wall infarctions and complex arrhythmias not seen on a standard ECG. Without needing to reattach the electrodes, 22 leads provide a 360o view of the heart, increasing the diagnostic capabilities and power of the CardioSecur ECG. 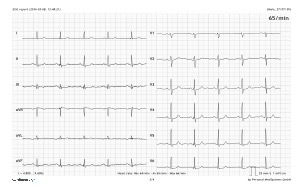 The following two case studies are examples in which the CardioSecur ECG detected changes not seen on the standard 12-lead ECG, leading to more rapid diagnosis and treatment of the patient. 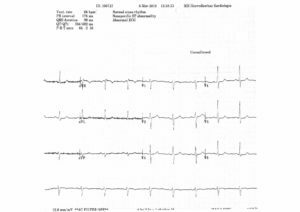 Case History: 76 year old patient admitted to the intensive care unit of a Budapest Heart Clinic complaining of progressive chest pain over the past 48 hours. He had a previous proximal LAD (left anterior descending artery) stenosis dilated and treated with a drug-eluting stent. 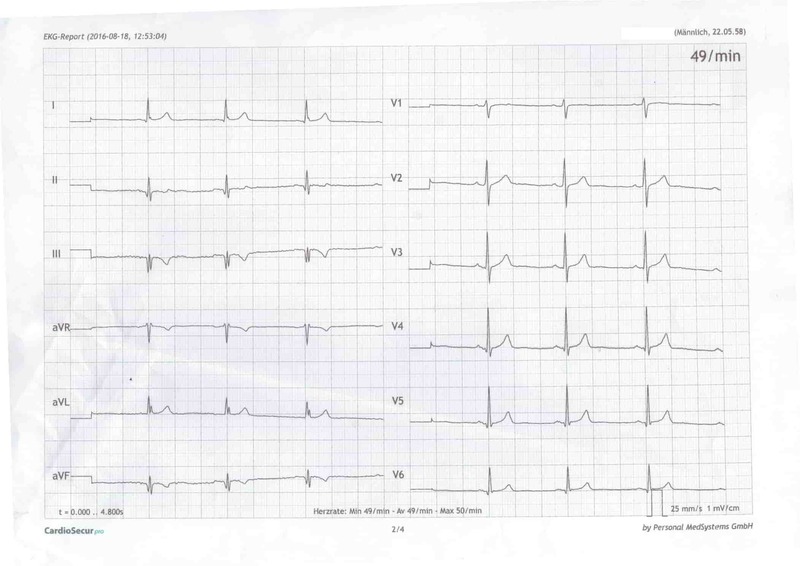 The classic 12 lead ECG (image 1) is unremarkable and does not show any sign of infarction. The CardioSecur ECG (image 2) was performed at the same time and shows a 0.1 mV horizontal ST depression in leads V3-5, indicating myocardial ischemia. Image 2: CardioSecur ECG – ischemia evident in V3-5. 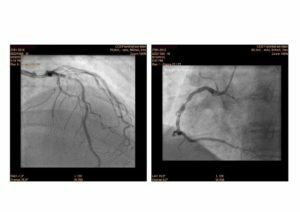 Coronary Angiography (image 3) on the following day showed a patent stent of the LAD (left anterior descending artery) and high-grade stenosis of the LCX (left circumflex artery). The stenosis was treated with a drug-eluting stent. 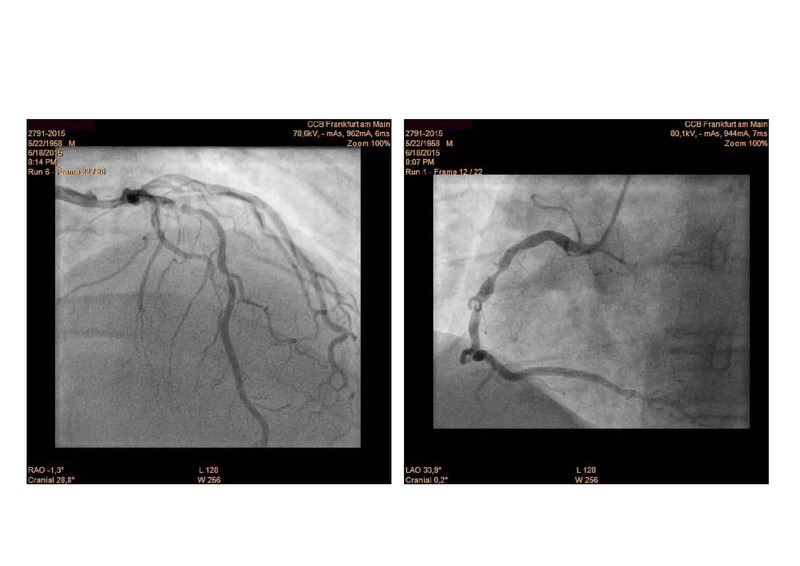 Image 3: Coronary angiography - high-grade stenosis of the LCX. It is commonly known that the first ECG in the setting of a fresh infarct can be unremarkable. In this situation, the CardioSecur ECG made a diagnosis possible. The LAD (left anterior descending artery) stenosis was proven, and therefore treated with dilatation and stent placement via cardiac catheterization. 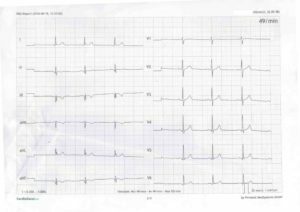 Case History: 58 year old patient presented to the clinic complaining of retrosternal chest pain radiating to the lower jaw, lasting 5-10 minutes and requiring him to stop when walking quickly, which had been present for the past few days. 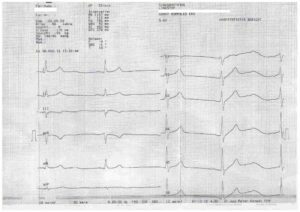 The classic 12-lead ECG (image 1) showed sinus bradycardia at a rate of 52 beats per minute with left axis deviation. Findings: rs-complex in leads III and aVF. Negative T-wave in lead III, positive T-wave in lead aVF. 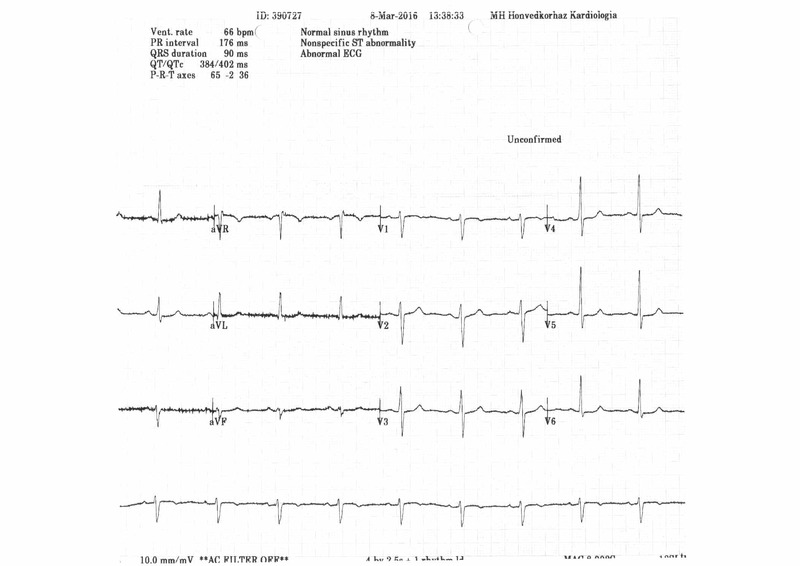 The CardioSecur ECG (image 2) showed sinus bradycardia at a rate of 49 beats per minute with left axis deviation. Findings: q-wave in lead II, qrs-complex in leads III and aVF. 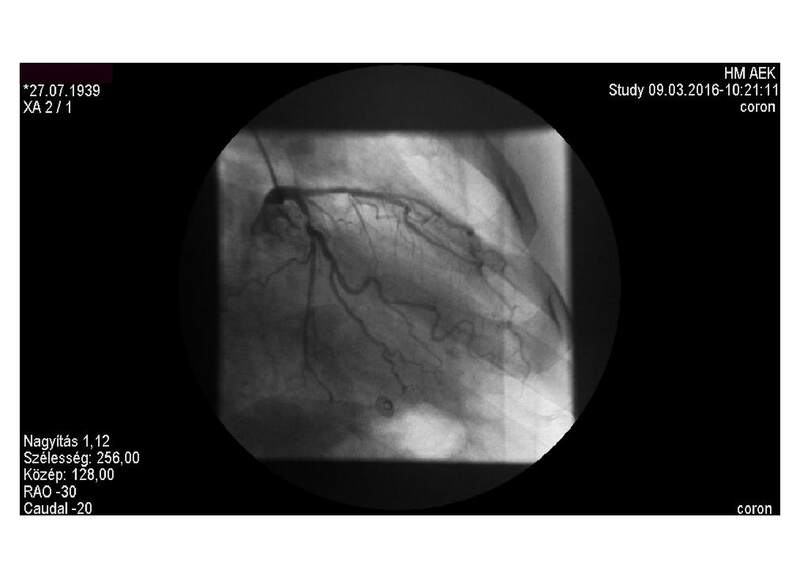 Coronary angiography (image 3) showed severe 3-vessel coronary artery disease. Intermediate mainstem stenosis. LAD (left anterior descending artery): proximal and distal stenosis. RCX (Right circumflex artery): narrow, no stenosis. RCA (right coronary artery): high-grade tandem stenosis. 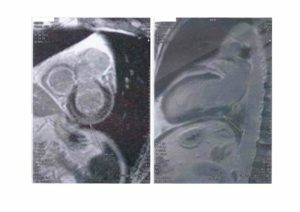 The Cardiac MRI (image 4) showed fibrosis, indicating a previous posterior wall infarct. Severe 3-vessel coronary artery disease was present in the second case. 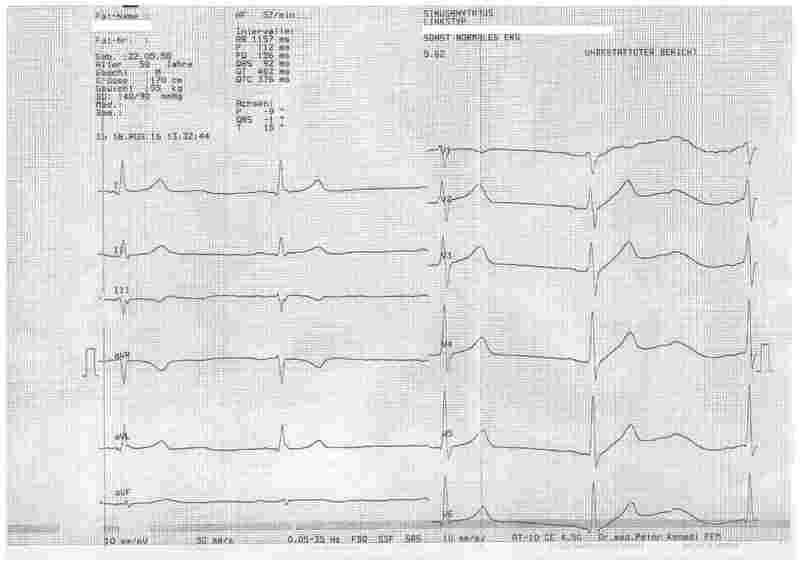 The classic 12-lead ECG showed only an rS-complex (not an obvious sign of a posterior wall infarct). However, as evidenced by a Q-wave in leads III and aVF as well as r-wave reduction, the CardioSecur ECG indicated a previous posterior wall infarction. An MRI confirmed this diagnosis.